dad was forty-six or so when i was born. i was the youngest of seven, twenty years behind the eldest. dad was a good catholic. a long-time usher at our church. mom, and most people i guess, called him charlie. i haven't lived as many years as they were married. a terrific bowler, awards, notices in the newspaper. we went bowling a few times when i was twelve or thereabouts. i was frustrated at my lack of skill. then he showed me how and when to let go of the ball, and it was like magic. the basement was his workshop, tools and models of ships and planes everywhere. i liked to spend time down there, sometimes alongside him as he worked, sometimes alone in its sanctity. it drew me in despite my fear of the darkness and depth. the smell, a mixture of sawdust, paint thinner, oil, was as mysterious as the adult world. sometimes my dad smelled like that. sometimes he laid on the floor, flat on his wide back, lifted little me into the air, horizontal, my tummy on the soles of his feet, my hands in his until i let go, then i put my arms straight out, like superman. he called me mugsy, though i'm not sure why. he also called me mister magoo, and baby pics of me and my big round noggin fully demonstrate the reasoning there. he wore giant corduroy slippers, which happened to fit perfectly on the feet of a big inflatable bunny i got one easter. with the slippers on, i could flip the bunny in the air and it would land standing. dad always laid on the floor to watch tv, on his side, arm crooked and head against palm, and one time i threw the bunny from the couch and it hit him in the back of the head. he turned to me and my brother, crabbed us out, which we found hilarious. i did a wicked impression of it for years afterward. he smoked a lot, raleighs. there were always tons of redeemable coupons around, rubber-banded into tiny bales, and catalogs showing all the neat stuff my dad's habit could buy. i was kept upstairs while the living room was prepared. i was asked, hear that? hear that? on the roof? i strained to see anything through the frost on the windowpanes. 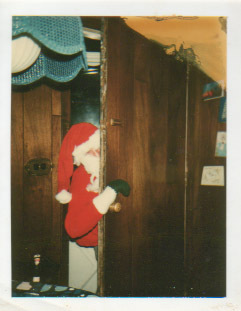 then i was brought downstairs and there was santa, waving a green-mittened hand from behind the front door. i stood several feet away in my orange footie pajamas, and to this day i cannot accurately describe what i was feeling as i gaped and waved and distractedly put a finger in my nose. i was taking out the garbage, what happened? there's a picture of santa, as he peered from behind the door. i studied santa's cotton-buried face in that photo for years. he worked on one of the skylabs. recently a friend asked me what my dad did for a living. when i told her, she said, so he was a rocket scientist? like, as in when people say, well i'm no rocket scientist, but...? I had never thought of it that way. but yeah, i guess he was. one of our beagles, brandy, had puppies, six of them. she had them under the couch while a brady bunch rerun was on, the one where alice skis down the ramp made of hay. we called them the brandy bunch. one pup, the sixth, was a runt. i kept a close eye on that one. i came downstairs one morning before school--kindergarten?--and they were gone. dad gave them away to people at work. he took me to see star wars, a couple of times. he loved the opening shot, underneath the imperial cruiser. he'd take me to the hobby shop whenever he went to buy new models, and he would buy me something every time. one time at toys r us, he was already buying me a toy, and i whined until i got an empire strikes back book too. he was angry with me, and later i was ashamed of myself. he had diabetes, and later cut down his heavy smoking and changed his diet. he lost weight and grew a beard, and looked better than he had. he had a great laugh, a kind of giggle. sometimes it was plenty phlegmy. we read stephen king books and talked about them. we didn't really talk about all that much else. dad and i took brandy to a place to be put to sleep when she was too old and sick to live. she had big, hard tumors in her belly and looked sad all the time. we put her in a cardboard box with a blanket and a favorite tennis ball, and put her in the car. she had hardly ever been out of our yard, besides the once or twice she'd run away and even then she'd never left the block. the place we went to smelled awful and the bedlam of yelping was unbearable. i thought they would put her down right then, but they said it would be the next day. we left her there, and i was nearly ill all night thinking of our dog in that horrible, noisy place, wondering where we had gone, why we had left her at what she must have known was the end. dad didn't cry, but driving home his face was grim in a way i'd never seen. we got a puppy a few months later. when dad and i brought him back to the north shore animal league for his six-weeks shots, rocky trembled in my arms. i thought it was cute, and i comforted him as he laid his head on my shoulder. it was less cute when he then threw up the whole chunks of hot dog my mom had fed him, directly down my neck and back. dad found this funny, and later i did too. sometimes, these days, i notice that i fart just like my dad. it made me laugh then, and it makes me laugh now. dad's last birthday was his 63rd. i forgot to get him anything, even a card. my brother dave and his girlfriend gave him their gifts as i sat at the kitchen table with them. i was so embarrassed at my thoughtlessness that i didn't say anything to him, that day or the next. that next night i came down from my room shortly before midnight to find a commotion in my parent's bedroom. my mother was standing over the bed, yelling for my father to wake up. he appeared to be asleep, sucking in occasional snore-like breaths. i called 911 for an ambulance. it came, and my family left for the hospital, the one i was born in, less than three blocks away. i stayed behind, i guess in case someone needed to be home. i read the medical encyclopedia as i sat on the floor in the bathroom. its facts about first heart attacks tried to be encouraging. rocky came into the bathroom and laid in my lap, pressing his head into my chest and whimpering. i sort of laughed, thinking of that night in the back seat with frank chunks down my back. i held that dog hard. an hour later i sat in the kitchen, not reading the newspaper laid out on the table. i didn't look up from it as my family came in the front door, silently. they came into the kitchen and living room, silently. everything in the world became different. every word i didn't say in the past two days choked me. my sister jackie stood behind me, put her hands on my shoulders, but i couldn't lift my head from the paper. tears loudly smacked the page, darkened, spread. i was sixteen or so when my dad died. i read, months after that night, in some book about grief i found in the school library, that people are often upset to realize they are gradually forgetting little things about their dead loved ones, like the way they laughed or whatever. i didn't like reading that. i didn't want to forget dad's laugh. i have forgotten many things about my father, there's no question. but i haven't forgotten that giggle. in fact, i hear it a lot.